Since 1985, Specialized Training Services (STS) has been a premier provider of exceptional training seminars, conferences, home study programs and publishing excellent books on contemporary topics. Our target audience are professionals from mental health, criminal justice, law enforcement, legal, nursing, drug/alcohol and education backgrounds. STS emphasizes forensic and clinical programs on topics of current interest, presented by well known authorities. Additionally, books, tapes, videos and related training materials may be purchased from our online store. Now in our 26th year, Specialized Training Services organizes, promotes and produces cutting edge training seminars and conferences of the highest quality. World class experts, who possess subject matter command as well as gifted presentation skills, are combined with exceptional meeting management to produce a seamless and gratifying learning experience. 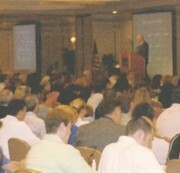 In 1992, STS was recognized for its outstanding seminars by receiving the "Excellence in Training" award from the International Association of Correctional Training Personnel. STS guarantees its programs to be of the highest quality and consistent with the written content.